Pineapple Upside Down Cake makes a timeless dessert. Topped with a signature pineapple and cherry topping, this pineapple upside down cake is a southern classic. 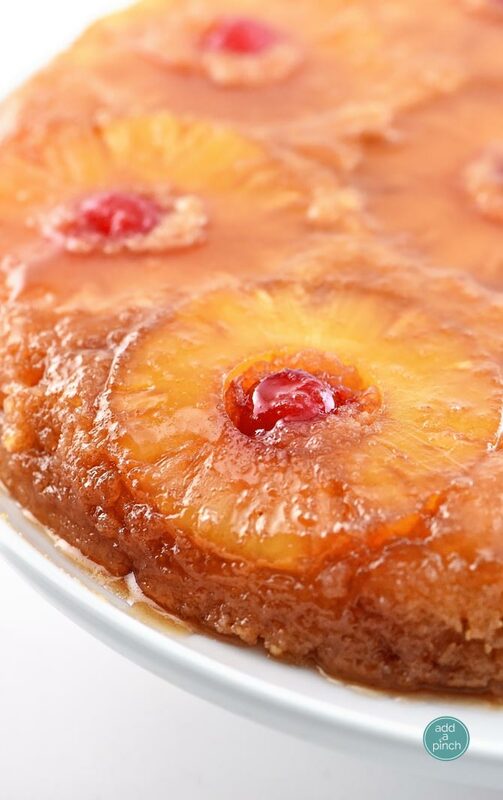 There are few cakes as nostalgic and classic as pineapple upside down cake. A timeless cake crowned with caramelized topping and rings of pineapple studded with bright cherries in the center. Each delicious bite takes me back to my childhood and watching Mama magically flip the pineapple upside down cake onto her cake plate without even a smidgen of the cake sticking to the skillet. 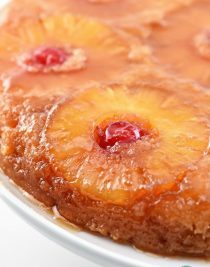 I always have loved a fresh, warm slice of pineapple upside down cake fresh from the skillet. There’s really nothing like it. To make my pineapple upside down cake, I pour my melted butter into a medium size cast iron skillet. Swirl the melted butter around in your skillet until the sides are well-coated with butter as well. If you don’t have a skillet, you can use a 10″ round cake pan as well. Then, I sprinkle a layer of brown sugar over the melted butter which makes the most delicious caramelized topping for your pineapple upside down cake! Next, you’ll need your pineapple slices. You can use fresh pineapple that has been cleaned, cored and evenly sliced into 1/2″ slices. 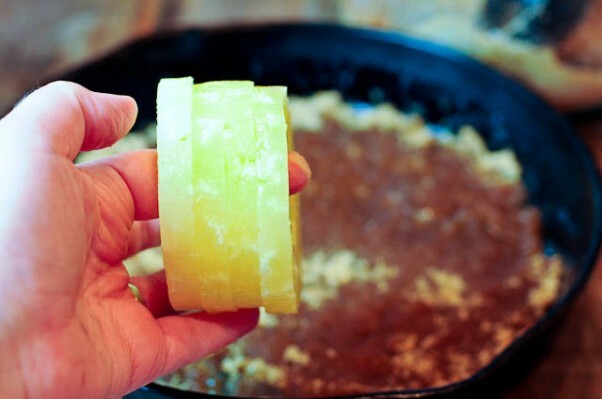 Or, you can just use canned pineapple slices. Either way works well. If you used canned pineapple slices, you’ll need two small cans. Place your pineapple slices on top of your brown sugar layer. Next, take your maraschino cherries and add one to the center of each pineapple slice for that signature pineapple upside down cake look! Now we’re getting to the cake part of the cake. In a large mixing bowl, add your buttermilk and pour in the rest of your melted butter, eggs, sugar, flour, and other dry ingredients. 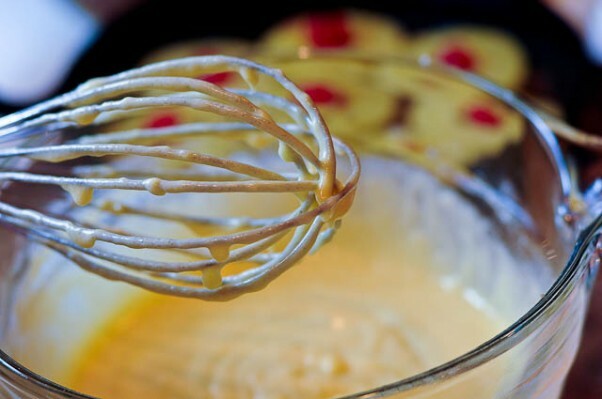 Give it all a quick whisk until your batter is well-combined. And then pour your cake batter over your pineapple, cherries, and brown sugar. Bake your pineapple upside down cake for about an hour. 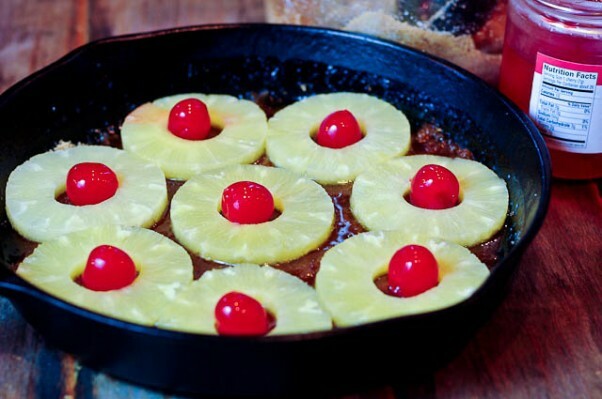 Here’s my Pineapple Upside Down Cake recipe. I think you’ll love it! Pour ½ of melted butter into cast iron skillet or round cake pan. Swirl the pan until the bottom and sides are well-coated with butter to prevent the cake from sticking. Sprinkle brown sugar evenly over the melted butter in the skillet or cake pan. 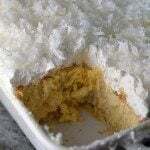 Place pineapple slices on top of the brown sugar. 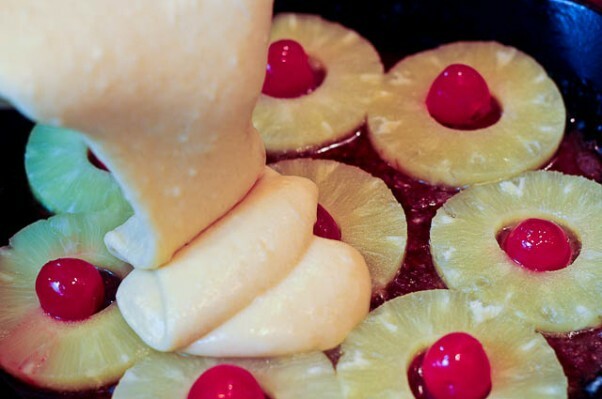 Add maraschino cherries to the center of each pineapple slice. In a separate bowl, combine buttermilk, the remainder of your melted butter, eggs, sugar, flour, baking powder, and salt. Whisk together until well-combined. Pour evenly over the pineapple, cherry, and brown sugar layer in the skillet or cake pan. Place in the oven and bake for approximately 45 minutes to 1 hour or until toothpick or skewer inserted in the center comes out clean. Remove the cake from the oven and allow to stand for about 5-10 minutes before transferring to a cake stand. When ready to transfer, place cake stand on top of skillet, then carefully flip to where the pineapple upside down cake comes out onto the cake stand. From the Add a Pinch recipe archives. Originally published 2011. You’re right – there really is nothing like a good pineapple upside down cake. The cast iron skillet is the perfect way to get a beautiful caramel. Love this, Robyn! I must admit that I didn’t have pineapple upside down cake until about a year or so ago. Just never appealed to me. But I was wrong! I loved it. And yours looks especially worthy baked in a skillet like that – beautiful!! I don’t think I’ve ever had pineapple upside down cake, but it looks so good! I think it’s about time I give it a try, don’t you? It’s been years since I made a pineapple upside down cake and I love them. I can’t resist a moist cake and this one does it right. Delicious! It’s a toss up for me. Do I love pineapple upside down cake or German chocolate cake better. Right now. This. Your recipe, the cast iron skillet, the perfect rings of pineapple with the cherries; all exactly like I was taught by MY mom…it’s not just a cake, it’s history in a dessert isn’t it? Love it. i almost can’t take it . . . sure do wish i were your neighbor . . . This turned out absolutely gorgeous, Robyn! I have been craving pineapple upside down cake for months but haven’t gotten around to making it! This looks fantastic – you made it look sooo pretty! I’m saving this recipe! Robyn awesome recipe delicious, made this today. I was always making the Duncan Hines version (which is good), but I always wanted a version from scratch. Thanks for this awesome recipe. You said it…Oh my word!! Pinning it!! i try this recipe, looking great,all i can say delicious!!!! I love me some pineapple upside down cake. Nothing better and this one is perfection. I’m making this TODAY! I’ve been looking for years for a recipe for Pineapple Upside-Down Cake like my Mom used to make. She made it out of her head. I never had a written down recipe for it. It was my favorite cake as a kid. This looks SO much like the one she made. I cannot wait to sink my teeth into this beauty. I love the way that upside down fruit cakes look. They are so pretty and festive! I also love it with peaches! I do, too – and apples. Oh my goodness! I love pineapple upside down cake!!! 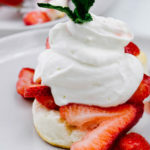 in fact, I love all desserts that you invert when serving. . so beautiful and elegant and so easy!!! love this! 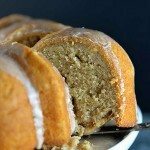 I love classic recipes like this cake, yummy comfort food! When I want a pure comfort food dessert – this is it. And always in a cast iron skillet!! This is gorgeous, Robyn! My eyes thought I had just stepped back into my childhood. And my mouth is watering. Oh my goodness. Thanks for reminding me of this, a favorite childhood memory! 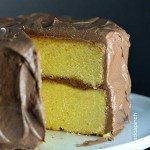 Will this recipe work in a 12″ cast iron skillet and if not what size cake pan? Thanks. But my Mom always added pecan halves in any of the open spaces left after the pineapple/cherries were placed. Adds another delicious taste, we used to try and sneak the pecans off the cake. long, but would check at 15 min. intervals with a toothpick. What if I don’t have any buttermilk? Can somebody please tell me if it’s normal that that cake top doesn’t look golden? The cake has been in the over for an hour and I’m about to take it out. Should I leave it in for longer? I have one of those convection ovens! I think I have a really big cast iron skillet not a medium one. Can I just use a cake pan? I had buttermilk in the fridge, which I thought would be an absolute must for pineapple upside cake. 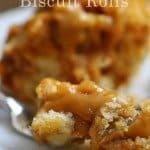 I started an online search and came across this recipe. Not only is it simple to make, but my daughter couldn’t stop raving about it! This recipe is heavenly…a keeper for sure! Thank you for bringing me back to my childhood. I’m so thrilled that you enjoyed it! It is always so special to have memories of our childhood and like you, this cake takes me back to those years as well! Thanks so much for your sweet comment! Glad to have you here – Welcome! I have not made this particular cake in a 9×13 pan, so I can’t exactly say how much you’d need to make it the size you are requesting. I usually make mine in a cast iron skillet. As I mention in the recipe, a 10 inch cake pan will also work with this. I hope you enjoy it! We’ve loved this recipe for years! I use a 10 inch skillet for this. I hope you enjoy it! this recipe was fantastic! My cake was gone within a day – :-). I wish I could upload the photo. I’m not certain why your pineapple upside down cake wasn’t golden. Just making sure that you did use butter in the skillet, followed by the brown sugar as that could make a difference in your cake when you turn it out. For this recipe, I use a 10-inch skillet or cake pan. If you used an 8-inch pan to get a taller cake, you may have needed to reduce the cooking temperature and increase the cooking time to make sure that the interior of the cake was well cooked. 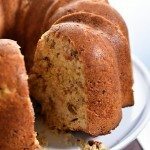 Can rum be added to this cake to add that flavour? If so, how much would you suggest? Can you add rum to this recipe? If so, how much? I’ve not added rum to this recipe, but I’m sure you could. I’m not certain on the amount. Did you use light or dark brown sugar? I used light brown, but dark brown will work as well. It will just have a deeper molasses flavor. If I use a 9×13 pan, do I double this recipe? Thoughts? I’ve not made it in a 9×13, Elle. I always make it in the skillet like in my recipe, so I can’t say how it will turn out. Thanks! I made this last night. Oh my!!! Absolutely delicious and I don’t normally like pineapple upside down cake. But…my cake was tough or doughy. Any idea what I did to cause this? I definitely want to make this again, MANY times! This cake is not one that will rise very much as it’s made in a skillet usually. If you look at the step by step photos I’ve shared in the blog post ahead of the recipe, it shows what the cake will look like after baking. Thanks! I thought the cake part was heavy, followed recipe. What went wrong? Pineapple, brown sugar mixture was good. I’m sorry you didn’t enjoy the cake. This is not a cake that will rise as much as some cakes as it is usually made in a skillet as you’ll see in the recipe photos in my post. I hope this helps – I am glad you liked some of the flavor though! Thanks! any ideas on how to make the cake chocolate? my cousin wants a strawberry chocolate upside down cake for her birthday.